This was a rare seedling found in a seedling lot of buartnuts that contained both buartnut and black walnut background. 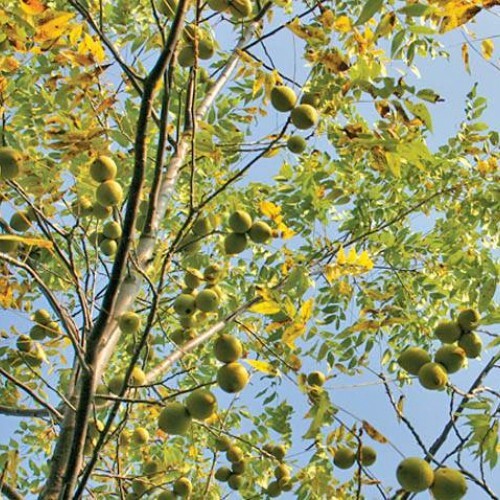 The seedlings produce a black walnut-like nut with a mild flavor. The flavor is similar to butternut, with a hint of hickory. 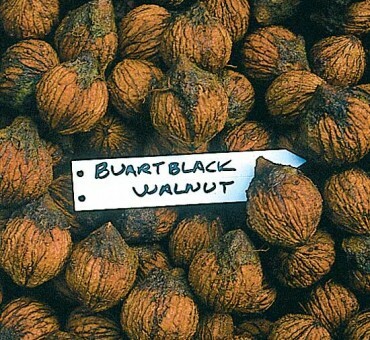 Unlike most black walnuts, nuts on buartblack are born in clusters all along the branches. This tree has out-produced all other walnuts on our farm. Seedlings are very vigorous, often producing a 2-3 ft. plant in one year without irrigation or heavy fertilization. 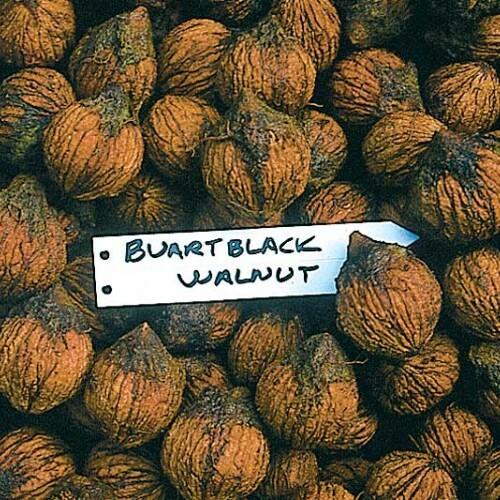 Buartblack would be good for timber as well as nut production but high nut yields slow its growth after 15 years. From pruning we have seen dark heartwood is produced in young trees. Made it through –30 F in NH. Really one of the bettter seed strains we have grown-even from seed! Good leaf retention too which appears in the subsequent generations. In other words, appears more immune to anthracnose compared to our 'local' black walnuts while the leaf color stays a dark green. Self fertile or will cross with other black walnuts. Durable in dry soils. Good in loam and clay. Anyone can grow it. Fruiting takes a while-4-8 years from seed. Vigorous plant growing 3-4 ft. a year once established.